Alcohol consumption has been identified as a modifiable risk factor for cancers such as gastric cancer. A new report in the The American Journal of Pathology sheds light on how specific proteins interact with alcohol, and how that interplay impacts survival and response to platinum-based adjuvant chemotherapy in patients with gastric cancer who may or may not still be drinking. It is the first time that a correlation between a key microRNA-processing modulator, transcription factor IIB-related factor 1 (BRF1), and prognosis of gastric cancer patients has been demonstrated. Investigators also determined that breast cancer susceptibility gene BRCA1/2, and myeloperoxidase (MPO) are more frequent in gastric cancer patients who engage in hazardous or harmful alcohol consumption. “Alcohol consumption is a known risk factor for gastric cancer, which carries high morbidity and mortality in China. We found that DNA repair–related markers—BRF1, BRCA1/2, andMPO—have good prognostic value in gastric cancer patients with or without harmful alcohol consumption habits. Moreover, these proteins are also associated with how effective platinum-based adjuvant chemotherapy will be for gastric cancer patients,” explained Hua Wang, MD, PhD, and co-senior author Kangsheng Gu, MD, PhD, both of the Department of Oncology at First Affiliated Hospital of Anhui Medical University, Hefei, Anhui (China). Researchers analyzed tumor tissue from 77 patients who had undergone surgery for primary gastric adenocarcinoma and 69 tissue samples taken from outside the tumor area. Among them, 66 patients received radical surgery and 57 patients received platinum-based adjuvant chemotherapy. All 77 patients were followed for an average of 18 months, during which time 94% (62/66) experienced disease recurrence. Patients remained free of disease for an average of 14 months (disease free survival, DFS) whereas the median overall survival (OS) was 20 months. 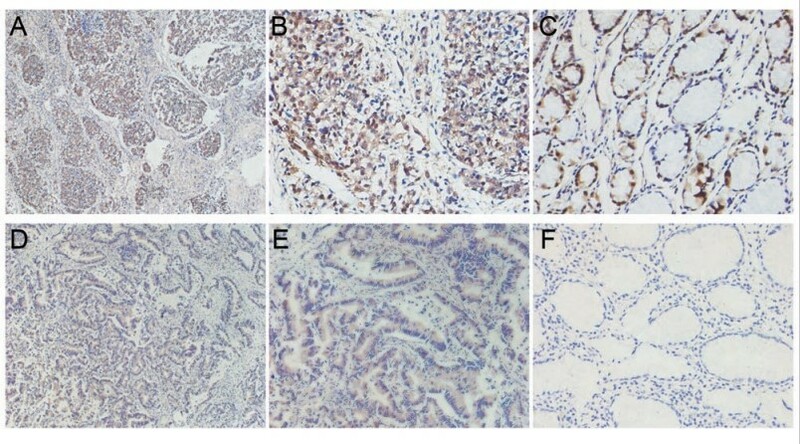 Immunohistochemical staining of transcription factor IIB—related factor 1 (BRF1) in gastric cancer (GC). A and B: High BRF1 expression in GC tissue. C: Positive BRF1 expression in GC para-tumor tissue. D and E: Low BRF1 expression in GC tissue. F: Negative BRF1 expression in GC para-tumor tissue. Original magnification: x100 (A and D); x400 (B, C, E, and F). BRF1, BRCA1/2, and MPO were also helpful in predicting which patients would benefit more from platinum-based adjuvant chemotherapy. For example, DFS was extended two-fold or more in patients who underwent chemotherapy and showed negative or low BRCA1/2 expression. For those with negative or low BRCA1, the average disease-free interval was 18 months compared to nine months in the high-expression group. Patients with negative MPO also had a better outcome trend, although it was not statistically significant. Importantly, investigators found that alcohol continued to have a detrimental effect in patients. High BRF1 expression and MPO-positive inflammatory cell infiltration were more frequent in gastric cancer patients with hazardous or harmful alcohol consumption habits. Abnormal changes in BRCA1 in tissues outside the tumors were more frequent in alcohol abusers. In previous studies, these investigators found similar correlations between BRF1 and alcohol consumption in breast and liver cancer patients. Understanding the mechanisms of how these proteins interact with alcohol and contribute to carcinogenesis is still being investigated. It is thought that RNA Pol III transcribes genes play a crucial role in alcohol-mediated tumorigenesis. BRF1 regulates RNA Pol III gene transcription, and its overexpression acts though BRCA1 to alleviate inhibition of RNA Pol III transcription. Measurement of MPO is interpreted as a measure of the gastric inflammation and oxidative damage induced by alcohol. BRCA1/2 and MPO also play key roles in DNA damage repair. The article is “Prognostic Value of the Expression of DNA Repair–Related Biomarkers Mediated by Alcohol in Gastric Cancer Patients,” by Yiyin Zhang, Hongyang Wu, Feng Yang, Jie Ning, Min Li, Chenchen Zhao, Shuping Zhong, Kangsheng Gu, and Hua Wang (https://doi.org/10.1016/j.ajpath.2017.10.010). It will appear in The American Journal of Pathology, volume 188, issue 2 (February 2018) published by Elsevier. Full text of this study is available to credentialed journalists upon request; contact Eileen Leahy at +1 732-238-3628 or ajpmedia@elsevier.com. Journalists wishing to interview the authors should contact Hua Wang at wanghua@ahmu.edu.cn. This research was supported by National Natural Science Foundation of China grants 81522009 and 81372577 and the Anhui Provincial Science and Technology Plan Project 1604b0602027.